The Pocket Canister is offered in a convenient size for storing small items. 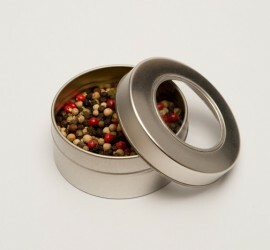 This versatile tin canister is perfect for the kitchen or for organizing the office and home. The clear lid allows you to keep track of what is stored inside. The Pocket Canister and Clear-Lid Canister do not feature a clicking cover and are not embossed with our company logo on the bottom.